To the surprise of many, VanCityBuzz has recently published a photo with the heading "One of the projectors and the projection being tested at TELUS Garden" which seems to depict Telus' completed purchase, installation and testing of their new giant screen as though it was a fait-accompli (http://www.vancitybuzz.com/2015/02/telus-garden-office-tower-boast-giant-projection-screen/). As a citizen who insists in due diligence in civic affairs, I admit that this type of contemptuous corporate behaviour infuriates me. - I wonder if it frustrates you also. 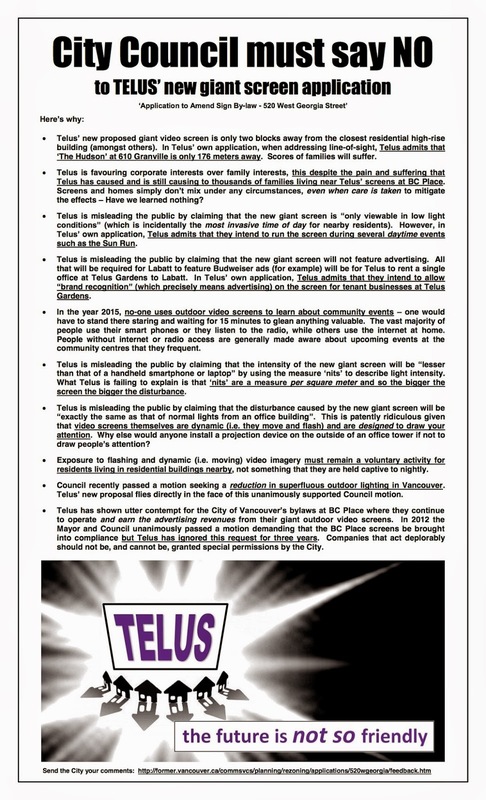 Over the last while, I have worked with a number of other downtown residents to prepare a list of ten questions that emphasise our main concerns with Telus' new sign bylaw amendment application, and I ask that you please have a read before making your decision concerning Telus' application. I do understand that Council may choose to convene a public hearing at which time I look forward to conveying to you in person and with more backstory, the elements that make up our primary concerns. Thanks for your attention to this file and to the important precedents that may be created therein. Telus’ new proposed giant video screen is only two blocks away from the closest residential high-rise building (amongst others). In Telus’ own application, when addressing line-of-sight, Telus admits that ‘The Hudson’ at 610 Granville is only 176 meters away. Scores of families will suffer. Is this not why we have bylaws to protect us? Telus is favouring corporate interests over family interests, this despite the pain and suffering that Telus has caused and is still causing to thousands of families living near Telus’ screens at BC Place. Screens and homes simply don’t mix under any circumstances, even when care is taken to mitigate the effects. Have we learned nothing? Telus is misleading the public by claiming that the new giant screen is “only viewable in low light conditions” (i.e. in the evenings, which is incidentally the most invasive time of day for nearby residents). However, in Telus’ own application, Telus admits that they intend to run the screen during several daytime events such as the Sun Run. So which is it? Telus is misleading the public by claiming that the new giant screen "will not feature advertising". However all that will be required for Labatt to feature Budweiser ads (for example) will be for Telus to rent a single office at Telus Garden to Labatt. In Telus’ own application, Telus admits that they intend to allow “brand recognition” (which precisely means advertising) on the screen for tenant businesses at Telus Garden. Has Telus not simply narrowly redefined the word "advertising" just to suit their current proposal? In the year 2015, no-one uses outdoor video screens to learn about community events – one would have to stand there staring and waiting for 15 minutes to glean anything valuable. The vast majority of people use their smart phones or they listen to the radio, while others use the internet at home. People without internet or radio access are generally made aware about upcoming events at the community centres that they frequent. Can anyone really claim that they've ever learned about any community events from the outdoor screens at Future Shop on Granville Street? Telus is misleading the public by claiming that the intensity of the new giant screen will be “lesser than that of a handheld smartphone or laptop” by using the measure ‘nits’ to describe light intensity. What Telus is failing to explain is that ‘nits’ are a measure per square meter and so the bigger the screen the bigger the disturbance. Can these misleading claims (which work really well in short news-cycles) really go unchallenged? Telus is misleading the public by claiming that the disturbance caused by the new giant screen will be “exactly the same as that of normal lights from an office building”. This is patently ridiculous given that video screens themselves are dynamic (i.e. they move and flash) and are designed to draw your attention. Why else would anyone install a projection device on the outside of an office tower if not to draw people’s attention? Exposure to flashing and dynamic (i.e. moving) video imagery must remain a voluntary activity for residents living in residential buildings nearby, not something that they are held captive to nightly. Would subjecting local residents to this nightly harassment really be a 'best practice' in the most densely populated residential neighbourhood in the country? Council recently passed a motion seeking a reduction in superfluous outdoor lighting in Vancouver. Would permitting Telus’ proposed amendment not fly directly in the face of this unanimously supported Council motion? Telus has shown utter contempt for the City of Vancouver’s bylaws at BC Place where Telus continues to operate and earn the advertising revenues from their giant outdoor video screens. In 2012 the Mayor and Council unanimously passed a motion demanding that the BC Place screens be brought into compliance but Telus has ignored this request for three years. Should companies that act deplorably be granted special permissions by the City? Telus’ new proposed giant video screen is only two blocks away from the closest residential high-rise building (amongst others). In Telus’ own application, when addressing line-of-sight, Telus admits that ‘The Hudson’ at 610 Granville is only 176 meters away. Scores of families will suffer. 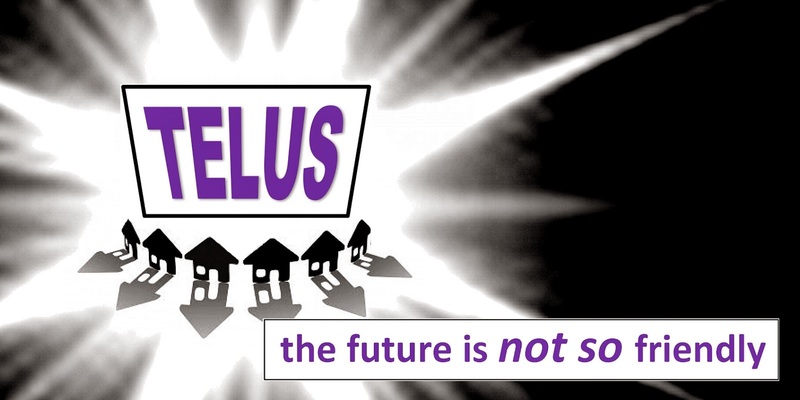 Telus is favouring corporate interests over family interests, this despite the pain and suffering that Telus has caused and is still causing to thousands of families living near Telus’ screens at BC Place. Screens and homes simply don’t mix under any circumstances, even when care is taken to mitigate the effects – Have we learned nothing? Telus is misleading the public by claiming that the new giant screen is “only viewable in low light conditions” (which is incidentally the most invasive time of day for nearby residents). However, in Telus’ own application, Telus admits that they intend to run the screen during several daytime events such as the Sun Run. Telus is misleading the public by claiming that the new giant screen will not feature advertising. All that will be required for Labatt to feature Budweiser ads (for example) will be for Telus to rent a single office at Telus Gardens to Labatt. In Telus’ own application, Telus admits that they intend to allow “brand recognition” (which precisely means advertising) on the screen for tenant businesses at Telus Gardens. In the year 2015, no-one uses outdoor video screens to learn about community events – one would have to stand there staring and waiting for 15 minutes to glean anything valuable. The vast majority of people use their smart phones or they listen to the radio, while others use the internet at home. People without internet or radio access are generally made aware about upcoming events at the community centres that they frequent. Telus is misleading the public by claiming that the intensity of the new giant screen will be “lesser than that of a handheld smartphone or laptop” by using the measure ‘nits’ to describe light intensity. What Telus is failing to explain is that ‘nits’ are a measure per square meter and so the bigger the screen the bigger the disturbance. Exposure to flashing and dynamic (i.e. moving) video imagery must remain a voluntary activity for residents living in residential buildings nearby, not something that they are held captive to nightly. Council recently passed a motion seeking a reduction in superfluous outdoor lighting in Vancouver. Telus’ new proposal flies directly in the face of this unanimously supported Council motion. Telus has shown utter contempt for the City of Vancouver’s bylaws at BC Place where they continue to operate and earn the advertising revenues from their giant outdoor video screens. In 2012 the Mayor and Council unanimously passed a motion demanding that the BC Place screens be brought into compliance but Telus has ignored this request for three years. Companies that act deplorably should not be, and cannot be, granted special permissions by the City.